To teach is indeed a calling. To know that what you do daily has the capacity to live far longer than you do is mind-blowing! I can't help but wonder if there are certain people that need the very words that come out of my mouth? Perhaps there are students who, for whatever reason, are in situations that you can speak life to, provide solace in, and help them get out of through embracing, encouraging, and empowering them. Embrace: This could be a physical embrace or a metaphorical one. Maybe a hug is in order or perhaps simply knowing that they can talk to and relate to you because though you are a superhero in their eyes, you are still human. Encourage: Maybe they need to hear something positive. Acknowledge their strengths, help them to identify and find areas of weakness to work on and improve themselves. Help them to see the value of personal responsibility. Empower: Teach them to reach, to dig, to expand and to grow, whether you are standing there or not. I was recently engaged in a conversation at an EdCamp during a session called "Building a Positive School Culture." In the session was the discussion of the concern raised by teachers, namely the "the loss of instructional time" that comes through school-sponsored events, the time taken to redirect student behaviors and combat the societal things that walk boldly into the classrooms, etc. I challenged them at the end of the session to flip the script. I create lesson plans every two weeks that are to guide the teaching and learning in the classroom. More times than not, there is a deviation from what I planned. In fact, if I were to be completely honest, I hardly ever stick to the strategic plan that I've outlined on paper. What I find to be true is that the real strategy is being able to deliver, provide or allow for what is needed by the students in the classroom at that moment, in the here and now, dependent solely on discerning the environment, knowing students and being able to be sensitive to the needs of others. That cannot be planned for, however, as an educator, I have placed myself in the position to be flexible and shift based on the needs. Perhaps in lieu of building school culture and cultivating a rich, innovative and dynamic learning environment, we should not see these deviations from the norm as loss of instructional time. Perhaps these deviations are more instructional than any 'instruction' will ever be. Perhaps it is the words or activities that flow that are much more meaningful for the time, and without them, the curriculum would not stick anyway. So, if I flow with the needs of the class and increase my sensitivity to the needs of the day, how much more will the content itself stick when it does occur. One who does not stay the same. This blog post is partly in response to an extremely intriguing and moving conversation at EdCampHCPS on Saturday, April 1, 2017, and no, it wasn't a joke! Haha. Aside from that, it has played an essential role in my own beliefs and practices as an educator. Thanks to Zac, Alex, Amber, Bryan, Nik, and Maria. What an awesome conversation we had! I was so fortunate to have been able to attend EdCampHCPS this past Saturday and not only that, but be able to facilitate a session or discussion or conversation about this topic: "Celebrating Diversity and Building Community." I find it important to start with a the why of celebration and building, but further, to identify a working definition for both diversity and community. I believe we are blessed to live in a world that includes different types of people whether those differences are realized through gender, race, culture, language, opinion, viewpoint (perspective) and life choices even. This is an important conversation to continue to be had. Is there a mold that students are expected to fit in when we really are all different with different backgrounds and experiences that must be taken into account because it makes us who we are? Is there a mold that we as educators are expected to fit in? Are we being asked to change the very essence of who we are rather than attempt to understand & celebrate diversity? The discussion ensued that students are often stripped of their diversity when we expect them to be who they are not, or to fit a predefined mold. How often do we as educators enter the classroom and assume this position: "This is how we do school," even unintentionally? Consider how we limit the learning experiences of students when we choose to intentionally or unintentionally expect every student to be the same. Suffice it to say we were able to start the conversation at #EdCampHCPS, but we were far from ending it at the time that we were scheduled to move onto the next session. Thus, the term diversity seems to encompass a whole lot more today than may have been identified years ago, or even captured by dictionary definition. How do you define diversity? Merriam Webster defines diversity as: "the condition of having or being composed of differing elements OR the inclusion of different types of people (as people of different races or cultures) in a group or organization OR an instance of being composed of differing elements or qualities." Why is diversity, specifically celebrating it so important? 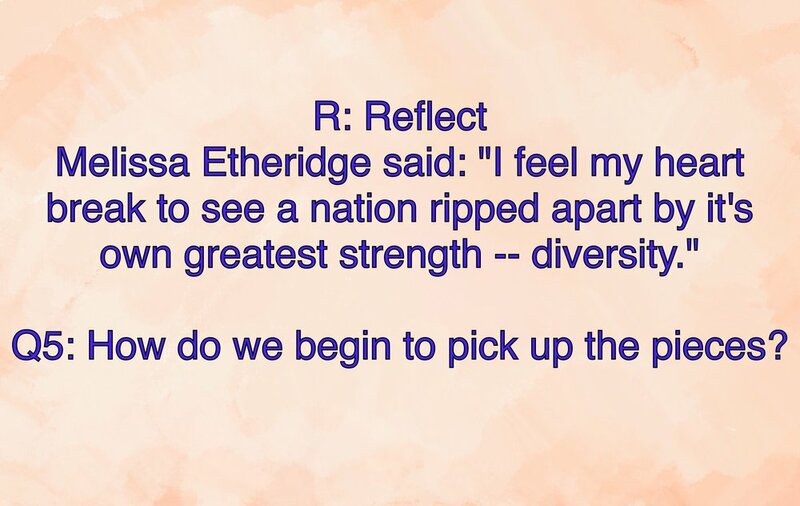 Melissa Etheridge qualifies diversity as our greatest strength as a nation but furthers her thought to suggest that it too has the power to break us down when we choose not to see the value in it and how it has the power to build bridges, fill gaps and connect us. "Diversity is not judging a situation before trying to understand a situation." Everybody has their own piece of the pie and the pie becomes whole when all of the pieces come together. Or consider the puzzle, if you will. 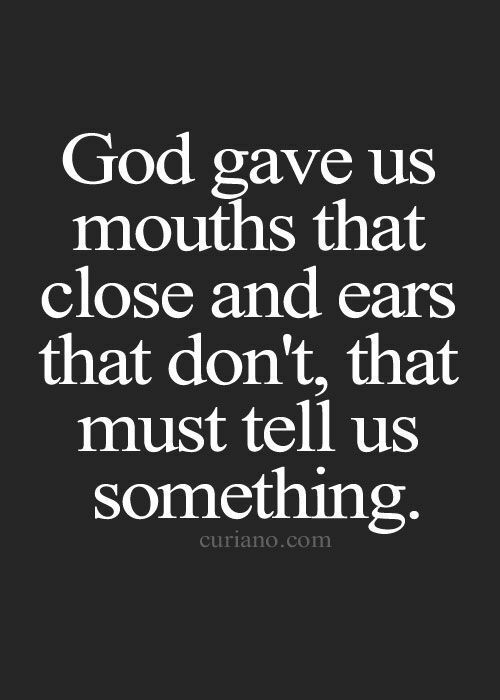 Everybody has something valid to say, but we need to be open to hear it! Diversity: the art of thinking independently together. I must say that I agree with these sentiments because I do not see how we will ever lose our difference. However, I do see how those differences can not be capitalized on when we choose to stay separated. We can be different and we can be together. Let's embrace our "different" while we sit at the table together. When you think about Dr. Martin Luther King's words here, you can see that though we all have stories, his goal was to bring change to serve the greater good. 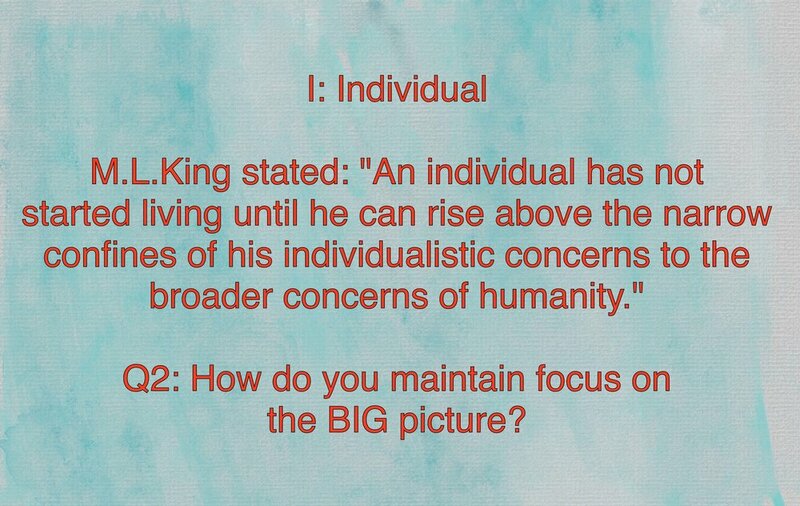 My perspective is that when we shift our focus on bringing change at this great a scale, it ultimately affects everyone anyway, including ourselves. It does not see us as separate and disconnected, but rather connected at the very core, and only separated due to viewpoints that have not come to the table of "together." What I mean is that there is great value in our own individual perspectives and viewpoints, but there is an immense power when we can bring those all together and reason. Where would we be without our ability to see. Let me be clear though, it is possible to be able to see and yet have no vision. We need a call to action. We need to not only understand the why of diversity but also things that we can do in order to bring change to our current understanding and fully move forward with the vision of understanding the role that each individual plays and the power that is created when all of these individuals have the space and time to come together. I think it is highly important for students to learn about other type of people, other cultures, others' backgrounds because when this can happen, we can understand for example, why people do what they do and understand how this new learning can improve the individual. I am better when I know a little Japanese, because I then can communicate with Japanese people. The wall or barrier that would have limited me before is removed when I am able to immerse myself into the learning about others that ultimately builds a bridge where there was once a gap. How do we take what could rip us apart and translate that into something that revolutionizes us? Melissa Etheridge's thoughts here really make me think. I find it to be amazing that this understanding or lack thereof can build bridges or tear them down. I have personally been in situations that as a black male I am looked upon as someone out to hurt or harm, when truly that could not be farther from the truth. Stigmas and stereotypes exists and often I feel the burden on my shoulders to be the antithesis of what we currently experience. I think this is a perfect example for how we may judge a situation prematurely rather than being open and willing to connect with people, because there is certainly a strength that comes when we take the time to be intentional about understanding and knowing that everyone is not the same, but that they may have an experience that will change me, or make better. So on the topic of student support, I believe that we must first learn about our students and their needs before we are able to support them. How are students best supported? Do they all have the same support needs? The answer is no. I believe that it is time well spent when we first understand that yes, we are different and ultimately when we are able to affirm the difference in students, the quicker we are able to use those differences to benefit everyone. Involvement is essential. We cannot make diversity and community big ideas unless we have others involved. How can be make it a focus? My goal is to include, whether directly or indirectly, a focus on diversity and community in every lesson that I teach or in every activity that I ask students to engage in. I want them to understand how what they are doing now is reflected in the real world and the connections between them. Not only are we speaking of meaningful learning here, we are talking about getting them ready for real challenges or experiences. Empathy is so important. You might define empathy as the ability of one to understand and share the feelings of another. Is it important to integrate this idea into our classrooms? Absolutely. Why? It would totally make us more mindful of what, how and why we do before we do it. It fosters an appreciation for this around us and how we can all help each other in this tangled web we weave. How do you define community? With regards to community, what thoughts come to mind when you view the pictures below? In what ways do these images reflect "community?" Merriam Webster provides the following as a definition: "a group of people with a common characteristic or interest living together within a larger society." When think about the following pictures below, I understand that each aspect of the environment or these living elements in the same place, has a role to play. They may have a common interest in the sun, or in oxygen and so while they may be different in organizational structure, genetic makeup, physical characteristics, and even their upbringing or origination to bring it to where it currently is, they can commune together in these photos. As part of the #FLEdChat Twitter chat on Wednesday nights, I have the fortunate opportunity to facilitate/lead a Celebrate Diversity ('Focus on Diversity') chat on every third Wednesday where the focus is on the importance of both diversity and community as these two components are married together. You can't truly have one without the other. Nevertheless, we converse about philosophy, practices, suggestions and even action plans for how we might embrace these two very important ideas in the classroom, creating the space for students to understand their importance as well as the education body at large. One of the content areas that I teach is English-Language Arts. I love to integrate technology into the core curriculum at every effective moment. And as a result, this year I moved students from using a paper-and-pencil blogging experience to an electronic means of students responding to their reading, either nightly or at the culmination of each book. Students were able to "personalize" their spaces and make them their own. "Class Press" was the platform and unfortunately they are discontinuing the site as of October 2017. However, students were able to "interact" in a space where they shared about their texts and could comment on each other's posts and asks questions where appropriate. As the educator, I was able to do the same. It was also a great way to help students learn revising and editing, because they could make corrections to their posts at any time. What I did not count on, or should I say "plan for," was the community that was built. Students really dove in to the idea of commenting on other students' posts. It was not strictly academic either; students were essentially "being themselves" within this secure space. I was able to introduce students to Digital Citizenship as well and how to appropriately respond or pose questions to others. Students had many "coming together" moments and continue to do so, although the platform begins to lose viability as it comes to an end this year. Students literally had conversations about the books as well as many generic topics or writing topics they chose to put on the site. It was enlightening to see the students be able to conduct themselves in such a mature manner as fourth and fifth graders. I am very curious about the direction I will take now, as I want to continue to have students blog in a secure space. I have definitely put a plug out there to Fresh Grade, an e-portfolio platform that I already use, as it will be yet another layer of ability and resourcefulness for the already booming student-centered company. In summary, instilling an appreciation for diversity and community is of great importance, as it serves the greater good. It points to the idea that we are better together. And in the words of Josh Groban, You Raise Me Up, to more than I can be. Some may say that being an educator is a profession of choice. Others might say that one becomes a teacher because his or her parents or grandparents were teachers. I propose that neither of the two are accurate enough to describe the integral role that educators play in the lives of everyone. Growing up as a child, there were behaviors I was born with, like crying for example. On the other hand, there were many things that were only grasped because someone taught me. Whether the individual doing the teaching had an official title or not, he or she was instrumental in guiding me along to learn the concept, principle or idea. We might say that the teacher(s) made a decision to act, because there was something that I needed to learn, and that they were able to teach me. Naturally, I learned from them. As a kid, I grew up in a very strict household, where my parents expected me to do as I was instructed and that I was responsible for handling my school work. I had the great privilege of connecting with my first grade teacher, who I still admire and respect today. She has a way about her, demonstrating care and concern, yet holding me accountable for anything I did wrong. What's more, is that she had such a great personality and I found much of my interaction with her to be fun and enjoyable. It was her tender-yet-strict-and-caring nature that inspired me. It is inspired me so much so, that I would go back to her classroom every day while I was a student at Hallandale Elementary School, to help her with any items that she needed. Continuing on through middle school and high school, I would always go back and visit and offer my help to her in the classroom. I graduated from high school with the second highest amount of community service hours as a result of what I would call, my passion to do what she did. This passion might be said to be acting on the call I felt to, like her, be part of the educator community. So yes, I knew somewhere deep down since I was a first grader, that I would teach in a classroom. You might say "that's not possible" or "that's crazy, you are too young to know what you want to do." Well here I am today and I have just completed my 10th year as a classroom teacher. Perhaps the call to teach was always there and my first grade teacher cultivated it, or watered the seed such that I am able to walk in that role today. Nonetheless, I am an educator today, because of her. So you might be wondering. What is the call? A call is a cry made as a summons or to attract someone's attention. It can also be defined as an appeal or demand for something to happen or be done. It is a powerful force of attraction. So the educator feels a strong pull to interact with students and to see them learn and grow. The educator answers that call by following the path to earn the necessary schooling and ultimately walking into the classroom ready to meet the needs of students he or she will teach. What does the call sound like? Well I propose that there is no sound, but rather there is an inward longing to act, to pass on knowledge, to allow knowledge to be created, to cultivate minds, to empower, to build, to enrich. What is passion? Passion also has multiple definitions: an intense desire or enthusiasm for something, a strong and barely uncontrollable emotion, and a state or outburst of strong emotion. I place great value in deciding to give something my all. Why do anything half way? If you go into a forest half way, you might as well go all the way, because you'll have to back track that half in order to get out of the forest. Being passionate is not only noticeable but it is contagious. If you are passionate about what you do, consider the passion "electric" and you can't even be near the next person without transference of some electric charge. What would happen if passion became electrically transferred because you decided that you were going in 100%? How would this new passionate attitude transform the mindsets and wills to learn of those you work with? How challenged would others feel to be better based on your decision to be better? The call and the passion can collide into an explosion of robust proportions. What happens when the call collides with one's passion? There is a huge difference between just being "present" and one who is passionate about what he or she does. The passionate are excited and motivated to embrace challenges, be the counselors, nurses if needed, and get down in the trenches with the students. The passionate understand the value of learning so much so that he or she will continue to learn and grow to become better at his or her job. The passionate does not allow complacency to set in because he or she knows that students are the ultimate recipients of all of the hard work put into education. The passionate engages and interacts with other educators to develop and collaborate through professional learning networks. The passionate develop their craft or skill through professional development avenues such as conferences, workshops and social media designed to learn. I would say about a month ago, I really begin to learn a lot about the amount of opportunities there are to learn that was not previous privy to. I happened to jump on Twitter to create an account and hopefully connect with other educators. 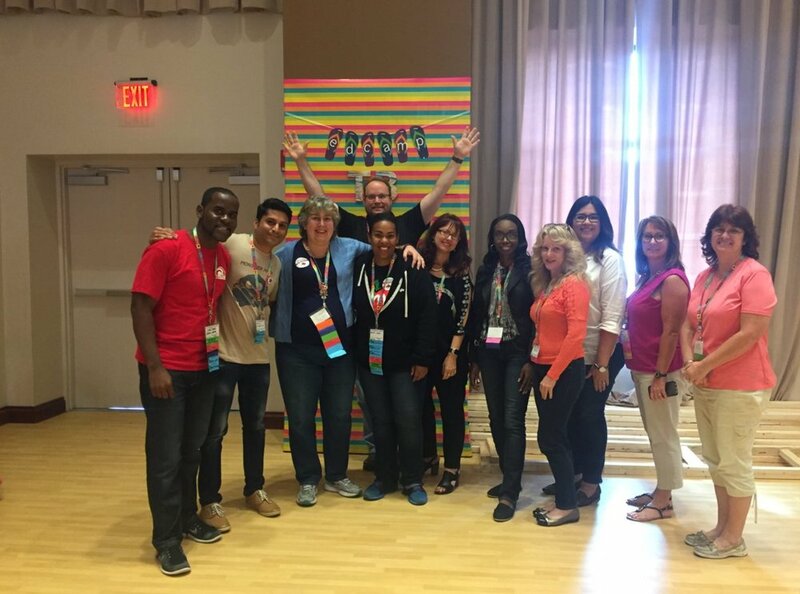 From that decision to develop myself by connecting with others, that led to Voxer educator groups and most recently my first EdCamp (EdCampMagic) on June 4, 2016. I learned so much through this initial interaction with other educators who all shared similar passions and stories for why they do what they do. I will attend my second camp, EdCampVolusia on June 11, 2016 and another on October 8th, EdCampTampaBay. When you think about an outlet used to transfer power through a cord, we the educators are extension cords that are plugged into the source, whether directly or as an extension of someone else's cord. The power of connection is just that, power! We have the power to change the world when we answer the call and are passionately in pursuit of continued development. I am so grateful that I have been able to complete yet another productive year of teaching and learning with my students. As this is certainly not my first rodeo, I understand that in this day and age, students experience so much pressure to succeed and do well but often lack the proper support systems with which to manage the challenges that they face from day to day. What does that look like? It could be the girl or boy, who has both parents at home, but needs extra support that may or may not already be provided to them. It might be that teenage kid that is the product of a single-parent home and the parent is doing all that they can to support them. It might be a child who does not have a very good relationship with his or her parents and is looking for a model or a mentor. It may be that child that likes what they see in you, and seeks to emulate who you are and what you do, but lacks the steps necessary or the knowledge necessary with which to take those steps. It might be the child who has both parents in the picture, but living in two different homes. Lastly, it could be that well-supported child, with both parents providing aid to him or her, pushing them to do their very best, but the child still looks to you to be their guide. Whichever the experience, it is never a bad thing for an educator to go the extra mile. This is what I will discuss here, with anecdotal input regarding the unrelenting need that called my name this year. Have you heard the phrase "To whom much is given, much will be required?" It is one thing to quote this but it is another thing altogether to see this idea pan out right before your eyes. Let's just say that I wear many hats at the school where I am currently an educator and next year, I will take add a few more to the hat rack. I am in my fourth year at this school, and clearly arriving at the said school was no coincidence. It might be the view of some that teachers are in their profession for the benefits, summers and holidays off and to collect a paycheck. A generalization at best, teachers are not always given the praise for the admirable job that they do. It is one fraught with many challenges from year to year or even from day to day, but some intrinsic motivation or voice compels the educator not only to answer the call to teach and facilitate learning, but to go back every day with a renewed passion to bring hope, light, strength and empowerment to the students he or she teaches to be the absolute best that they can be. There are no limits, except for the ones set forth in the mind of the child, which could be as a result of what he or she experiences, or doesn't experience. So, what does it mean to "go the extra mile?" The idiomatic phrase could encompass a variety of different tools, strategies, tricks, or tactics demonstrated by the educator to bridge gaps, support students in their learning, bring hope or light to a challenging situation or simply put a smile on a student's face. This is where I would like to mention the first story, of which I shall not mention any names specifically. Last school year, I had a student, who we shall call Student A, that came to me with challenges in the Language Arts content area, and I immediately begin to work with the student to grow them to a level that was consistent with grade level expectations. 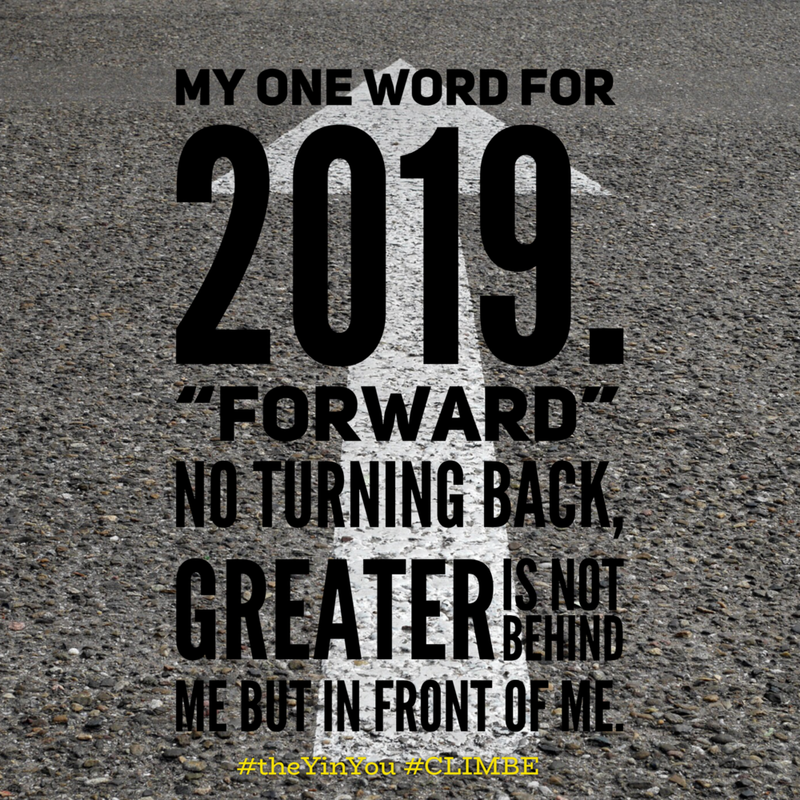 Things were progressing nicely but as the year went on, I began to learn of other challenges faced by the student that may have placed limits on learning. I decided to get involved and act as another support system for the student, who would hopefully come to me when help was needed, and to make some good of a difficult situation. As a result of the extra time that was spent with this student, the demonstration of care and concern and the establishment of an unofficial mentoring relationship with the student, there was a complete turnaround. Not only was there an increased motivation on the part of the student, the student academically began to excel, and while not completely out of the woods, was making great strides to get there. The parent was thrilled with the change in the behavior because I simply took time. I found myself attending extracurricular activities to support the student as well as devising ways to interact during the school day. This was a win, because I decided to go the extra mile. I must say that I love diversity and all that it brings to any situation. It is great to learn from others and our experiences and viewpoints are all so varied and meaningful. That said, I have noticed that students tend to look for those that they feel they can relate to at school. That may mean that girls will cling to warm, inviting female teachers or that minority students may look for minority teacher representation within the school. This is not division in any way, but simply their search for a model to pattern themselves after. The second scenario I will share is another student who I taught, but then returned to me in a different capacity for support. This student was dealing with the challenge of balancing life with mom and dad, who lived in separate home situations. In addition, the student was on a search to understand or learn who they really were. The student in question had been having behavioral challenges at school, because he was trying to fit in, balance home life, school life, and at the same time, facing the quest to identify himself. I stepped up the plate in this situation also. I listened to him, allowed him to come to my room during times of need and even to take a break from the norm. The student became very comfortable with coming to me when a talk was needed, or when help was desired on an assignment, a speech, or talking through a problem orally. I have taken time outside of school to interact with the student in a mentoring capacity due to the nature of the need and the expressed interest by the parents of the student to form this mentoring relationship. How has it helped you ask? Well, not only have I been labeled as "uncle" now, I receive hugs almost every day or the student is sure to come and greet me daily. In addition, his achievement has skyrocketed and the students I currently teach are able to look up to the student in question. Another win here for going the extra mile. I could have not taken the time, but consider how that may have negatively impacted the student, who, might I add is very intelligent with tremendous potential. Being an educator is not easy for obvious reasons, therefore being a passionate educator that is willing to go the extra mile is not as common as it should be. Consider how things might change for all parties involved if the student(s) felt supported. There is much more to be gained from such an experience than what may be lost. Go the extra mile. It might just light the fire in a student that is not easily extinguished. I'd love to hear your thoughts about this blog. Please feel free to comment or contact me on twitter, @dene_gainey. As a tree "climbs" and produces fruit, so does this philosophy. You might be wondering, what is the C.L.I.M.B.E. philosophy and how does it pertain to education? I firmly believe that there is a need for role models, mentors and individuals to make a difference in their area of influence. How then, does this philosophy apply? This is an idea that I have been developing over some time. Students must have insight, wisdom and guidance for the future of society and them individually. It is important that the knowledge and experience that one has is shared with others, otherwise it is simply knowledge that you will leave this world with. I am a lifelong learner. Cultivation of knowledge seekers, students who are free and driven to explore their passions and creativity in life is important. Students need an environment where there are no limits and they are free to be who they are, and want to be. Among every group are those individuals who lead. With any great organization, there must be solid leaders. With this in mind, leaders have to be developed. Students need to understand what it means to lead and be granted opportunities to do so, even in the developmental years. As a teacher, I take great pride in this aspect of the philosophy. You never know who you might be teaching or what the result will be of you teaching them. Therefore, there is no such thing as small inspiration. Create a spark, add a log to a fire, allow them the opportunity to feel around, poke around and explore. M (Motivate): This speaks for itself. I have always believed that motivation is 75% of my job. If I can motivate students, then everything else is easy. B (Build): What does it mean to build? You might say to form or construct or to empower. Yes, I believe that through good habits, organizational skills, opportunity, students can build their confidence and ability. With this in mind, there is no little thing I do in the classroom. It is all intentional, deliberate, on purpose, with their future in mind. E (Enrich): To enrich in my mind, is to stretch. I tell my students that you won't leave my class the same way that you came in. By the time you leave you will believe what you may not have believed in the beginning. "You will realize that the power to excel lies within you."